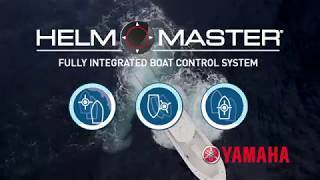 Captains of large offshore boats have already discovered the incredible ease and precision of Helm Master®. This fully integrated boat control system includes an enhanced binnacle control, a streamlined digital display, push-button start/stop switches, an RFID key fob and an innovative joystick. It’s the joystick that moves the large craft in surprisingly agile ways. 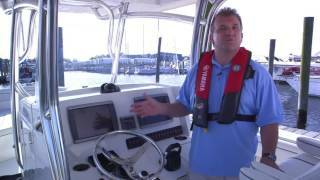 This makes navigating crowded marinas and docking in tight slips much less intimidating. 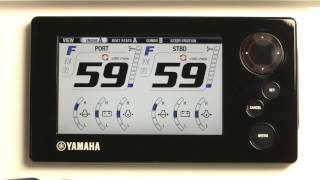 Now, Yamaha has made boating even more effortless with the latest version of Helm Master’s SetPoint® modes. Fine-tuning your position while in StayPoint®, FishPoint® and DriftPoint® using just the joystick is now possible, as well as NEW Pattern Shift for more precise operation below standard in-gear trolling speeds. 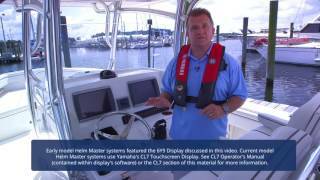 Boats with earlier Helm Master systems can be updated to include the new features, as well. Application-specific control of your craft. 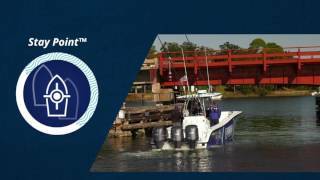 Fish directly below the boat, wait for a bridge to open or maintain position at a fuel dock—easily—with Set Point®. 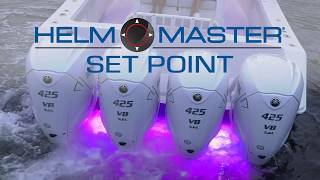 The new Set Point suite includes Fish Point, Drift Point and Stay Point modes, which allow you to automatically lock in your position, heading or both. 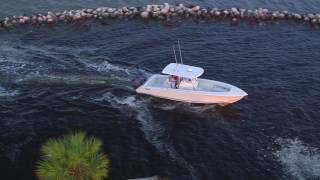 Point your bow or stern into the current to stabilize the boat’s lateral motion, and select FishPoint®/Bow or FishPoint®/Stern to use minimal RPM to hold your position. A NEW feature allows for one forward/rearward/sideward bump of the joystick will move the boat’s position in 10-foot increments up to 100 feet. FishPoint is perfect for stationary fishing directly below the boat, and it’s as quiet as it gets without dropping an anchor. Keep your bow pointed in a certain direction and drift. DriftPoint® uses a dual antenna GPS to maintain your heading. A NEW feature allows for one twist of the joystick that will move the boat’s bow heading angle by 5 degrees and additional twists will rotate it by up to 50 degrees. 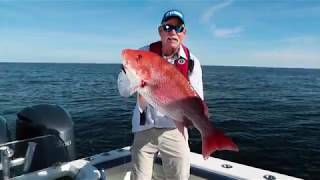 DriftPoint® is great for drift-fishing a wreck, kite fishing or watching a sunset from the stern. 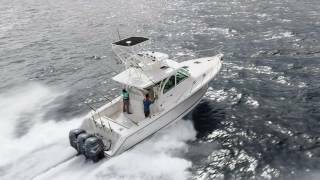 This mode “marks” your position and heading, and uses Helm Master’s dual antenna GPS and independent outboard articulation and thrust vectoring work to maintain that spot within 10 feet of your mark (in ideal conditions), and within a 75-foot circle in higher winds and currents. The NEW features will allow for one forward/rearward/sideward bump of the joystick will move the boat’s position in 10-foot increments up to 100 feet. One twist of the joystick will move the boat’s bow heading angle by 5 degrees and additional twists will rotate it by up to 50 degrees. 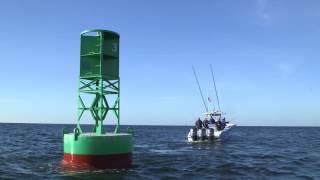 StayPoint® is handy when waiting for a bridge or your turn to approach a fuel dock. Twist or apply pressure to the joystick in a given direction and the engines respond instantly, with thrust that mirrors the amount of movement you input via the joystick. 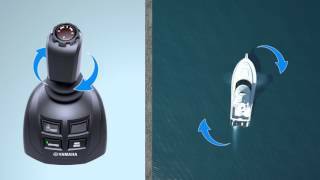 Intuitive joystick maneuvering allows you to move your boat in forward, reverse, laterally left or right, on a diagonal or to pivot it 360 degrees in place. 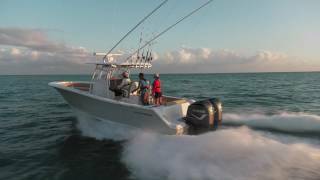 Helm Master® uses simultaneous forward and reverse propulsion, along with steering control, to position and move your boat. The joystick makes this maneuverability look simple, but beneath the water, each of your outboards may be in a different gear, at a different angle and at a different RPM to achieve a desired move—be it diagonally, side-to-side or pivoting on point. 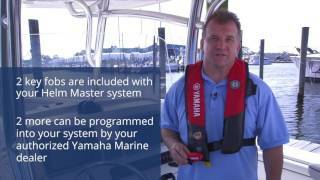 The Yamaha RFID key fob engages multiple outboards to start, and also activates the Y-COP® outboard theft-deterrent system. 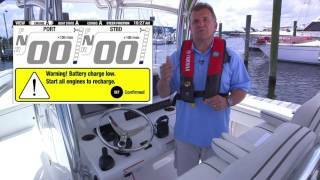 Y-COP® disables your ignition and fuel systems for security while your boat is unattended at the dock. 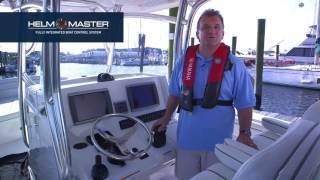 Helm Master’s enhanced binnacle adds another level of control to your boating experience. It allows you to automate trim adjustments and speed control, select your second station, single-lever operation and center engine(s) only operation, all with the touch of a button. Press this button to select your second station. Once you reach your desired RPM, press Speed Control to hold or throttle up or down with the touch of a button. Press this button to control up to four outboards with the port-side lever only. Program trim angles to specific RPMs, setting five points throughout the full RPM range. This automates engine trim as you accelerate or decelerate, maximizing performance and fuel economy. This button throttles up the selected engine, when the shift function is disengaged. Press this button to run only the center engine (or engines) when trolling or in no-wake zones. The newest Helm Master® feature allows the operator to troll below standard in-gear trolling speed by shifting into or out of gear to meet a desired target speed. In calm water, resulting minimum speed can be set at less than 0.5 MPH. 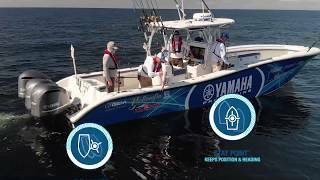 Yamaha’s most exciting and streamlined instrumentation yet, the CL7 allows you to monitor vital boat functions and the performance of up to four outboards on a single screen. With new functionality and software upgrades, CL7 now has Command Link® capability, which includes gauge integration, mapping and NMEA 2000™ networking. The new CL7 touchscreen display includes the option of built-in, detailed freshwater and saltwater maps. It also allows you to access SetPoint™ to program your preferences for the new FishPoint™, DriftPoint™ and StayPoint™ modes. 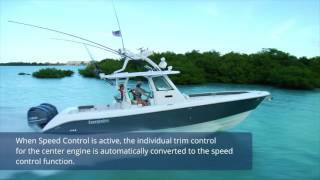 Helm Master’s maneuverability and some of its new SetPoint® functions are achieved with independent outboard articulation and thrust vectoring. 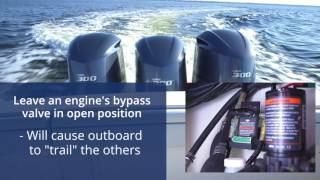 So, each outboard may be running at different RPM or in a different gear, all at once, to achieve a desired maneuver. Through the CL7, you can customize settings such as screen contents, steering friction, display appearance and auto-off power-down timing. 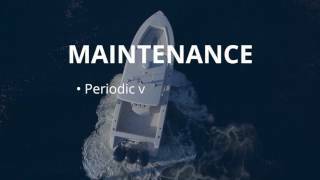 You can also monitor critical boat stats such as battery charge level, fuel flow and economy and rudder angle. And that’s just for starters.